What Is A Relic Machine? A “relic” machine is a metal detector that is good for shallow and deep coins, jewelry, and a large variety of very old lost ferrous and nonferrous objects of all sizes. In other words, a “relic” machine is an all-round useful detector ready to handle most any type of target at most any site at maximum potential depth. A “coin” machine is more limited in that it's mostly designed for shallow coin-sized objects. A “coin” machine is usually less sensitive and therefore it's far more affected by ground masking than a true “relic” machine would be. The “coin” machine just shuts down with too much ground masking (minerals or trash iron) partly because most people set the discrimination too high. A “relic” machine can better separate iron from deep nonferrous objects because it's usually more powerful and due partly to lower discrimination it's does better at pulling coins out from trash iron. The very best hobby/professional coin, jewelry, and artifact machines made today are the so-called “relic” machines. Due to so much misunderstanding of the designation “relic,” many manufactures have ceased using the term in relationship to their various detector models. Generally speaking people won't buy a “relic” detector because they have it in their minds that “relic” means horseshoes and square nails. Therefore “relic” machines usually only sell well to the serious treasure hunters. Most people today are happy to go to the local park and dig new clad coins and gum wrappers. So the manufactures favor the majority. Certain metal detectors excel today as “relic” or all-purpose super deep machines. One of those is the true American made (not Chinese with an American label) Ground Hawk. The Ground Hawk is now out of production for the reason stated above but from the early 80's it has been known as an excellent “relic” machine. The Ground Hawk is extremely difficult to find in used condition. Most who own one won't sell. My test model came to me from a southern owner and it is the UNLOCK/LOCK model. This model is one of the hardest to find and it's one of their best. One has the option of hunting in all-metal and also check the target in discrimination or one can simply hunt in discrimination and check the target in all-meal mode. This is all done with a Tejon type trigger mounted under the rod. The GH pinpoints perfectly and no pocket pinpointer is ever needed. It doesn't overload on close targets and set properly it won't give false signals. I tested the GH up against the Tesoro Tejon and the Ground Hawk could find anything the Tejon could find. Unlike most detectors the GH has those nice sounds on various targets. Deep silver has that sweet soft mellow sound and iron is broken a sharp. The GH works awesome on anything made of gold. The discrimination is superior to any other machine I've ever owned. The Ground Hawk can distinguish a gold chain from a rusty washer. It can ID a nickel coin beside a large piece of iron. I've never seen anything like this before. I enjoyed my testing of this excellent unit and am very sorry it's not longer being made. However, I've been told most any good detector repair can fix it if anyone ever does have a problem with theirs. This is a super great coin/jewelry/artifact machine. I recently bought my Ground Hawk and have had a pleasure using this machine. You get good depth, easy ground balancing, and will find more with this detector than with most. Now is considered a relic detector but it finds everything, and it finds it GOOD. I have yet to recieve a false reading and everytime I used it always read items under the ground true. It rejects iron great and is really a pleasure to use. This is my favorite detector out of all the ones I have used. Dont get me wrong I like alot of them but this machine has found a home. When I first heard about this detector on the American Relic Hunters web site, I knew I had to find out more. Going to the company web site at groundhawk.com, I was impressed with what I read and saw, so I gave them a call. I learned that owner and designer Ken Ray is a passionate relic hunter who just so happens to also be an electronics whiz, owning Ken's Electronics in Henderson, Tennessee. After talking to Ken for about an hour, it was obvious that he had the desire and ability to build a great relic machine, so I ordered one. The machine arrived three days later, and I wasn't sure there was anything in the box. Very light. It took me about two minutes to assemble it, and it kind of resembled a Fisher 1266, one of my favorite detectors. The balance of the Ground Hawk, with its 8 inch coil was perfect, and the build quality and fit and finish were top notch. But how would it perform in the field? 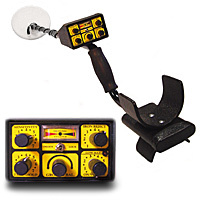 The Ground Hawk is a threshold based detector with two modes of operation. The first mode, and the one I prefer, is the Unlock mode. In this mode, the detector runs in all metal, and when you encounter a target, you just pull the trigger to determine if the target is good, based on where you've set the discriminator. The second mode, the Lock mode, runs the machine in constant disc, which I set at two, and when the trigger is pushed away, the disc switches to six. I found this to work great in high levels of mineralization, which I'll talk about later. I took the detector to one of my favorite sites, which I've hunted often. The ground matrix changes often and radically. With the machine's 15 turn ground balance and balance meter, it was easy to initially set up. I ran it in the unlock mode, and it ran smoothly, with a pleasant raspy threshold. I set disc at 5 and started scanning. When I encountered my first target, I pulled the trigger, and heard a pop followed by a slurp, indicating small iron or foil. Digging it, sure enough it was an iron nail. The Ground Hawk never lied when it came to small iron. If it popped or slurped, it was a bad target every time. I got to the point where I hated that slurp. BUT, if it had a POP, BEEP, SLURP signal, you better dig it. I did this several times thinking it was a nail. It was, but there also was a good target in the hole. The beep was always right on. Sure, many times it was a shotgun shell, but that's about the same signal as a button. And I dug several buttons and button backs, along with a mix of 58 and 69 caliber bullets. This machine is hot, and I mean hot on lead and brass, which as a relic hunter I'm primarily looking for. Running in the Unlock mode allowed me to know where the iron was, always a good sign, without having to dig it. My initial concern of the 8 inch coil being too small was quickly silenced. Whenever I was in the neighborhood of a target, not necessarily over it, the machine let me know, so I could investigate it further. And Ken had told me that coil size does not necessarily correlate to depth. I really didn't believe him at first, but realized later that he was right, at least with the Ground Hawk. It had great depth over the entire width of the coil, and mineralized ground did not seem to diminish depth very much. When we moved to the fields I had a little more difficulty ground balancing the detector because the ground is the hottest I've ever encountered. I changed to the Lock mode, and while the threshold wasn't as smooth, because it was picking up the minerals, whenever I heard a beep and had it repeat when I pushed the trigger forward, it was always a good target. Sometimes deep, sometimes not. I dug a 7.5 pound shell about 18 inches deep. Sure, any detector would hear that. But three other detectors saw it as small iron in that ground. Only the Ground Hawk gave a solid beep. Several times one of my hunting partners called me over to check his signal. He said it sounded like a button to him. The Ground Hawk was always right. Sometimes a button or bullet. Sometimes a nail. I ended up running around checking my partner's signals so they didn't have to dig. I'd own this machine for nothing other than the discriminator. Headphone jack-under the cuff where it should be-cord never moves while detecting. Battery pack-easy pull off end cap. Grip-solid semi soft rubber-not soft foam. Pinpoint-X the target and dig. Meter-gets you in the neighborhood to ground balance-a nice addition. Battery life-25 hours so far and indicator light still not blinking-don't know how much longer the 8-AA's will last. Coil bolt-thick plastic with sturdy collar-coil doesn't move. And as I said the total overall construction is top notch. Ken first built this machine in 1982, and I'm sure he's made improvements along the way. I use many different machines and like them all. But this machine will permanently stay in my arsenal. It's what I would have designed if I had the know-how.